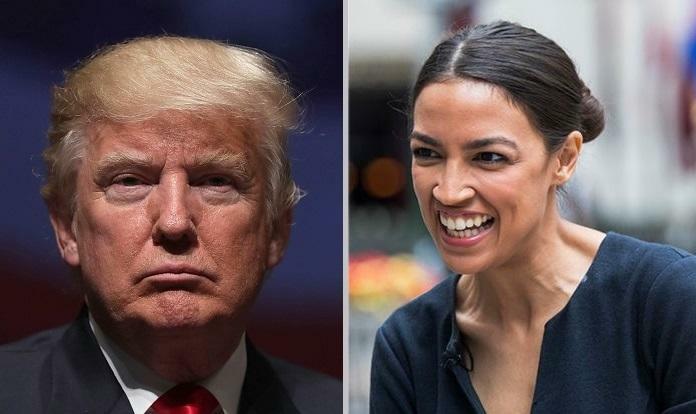 A new Rasmussen poll found that President Trump and "insurgent" Democratic Rep. Alexandria Ocasio-Cortez (NY) would be neck and neck in a hypothetical 2020 presidential matchup. This is essentially a tie, given the margin of error for this survey is +/- three percentage points. Not surprisingly, 69% of Democrats would rather vote for Ocasio-Cortez, while 75% of Republicans would cast a ballot to reelect Trump. Trump is the favorite among voters not affiliated with either political party by a 46% to 35% margin. The poll, which sampled 1,000 likely voters between January 10 and 13, also found that most voters think Trump will likely win again in 2020 - although Democrats are "more enthusiastically" entering the upcoming presidential election than other voters. 48% of men polled prefer Trump over Ocasio-Cortez, while 39% of women said the same. 43% of women preferred Ocasio-Cortez. By race, black and other minority voters supported Ocasop-Cortez in the hypothetical matchup, whild almost half of white voters preferred Trump. An August poll put former Vice President Joe Biden ahead of other Democrats as the top contender to take on Trump in 2020, with Bernie Sanders coming in a "fading second," according to Rasmussen. Perhaps most notable, however, is that three-out-of-four Democrats think their party needs someone new to enter the 2020 race - at least six-months ago. Up to 40 prominent Democrats are estimated to throw their hats in the ring for the party's 2020 nomination, which has rubbed many Democrat voters the wrong way.